Angela Ferguson heads across the Mersey to check out this year’s Liverpool Everyman rock ‘n’ roll panto offering, The Snow Queen. Photos: Robert Day. 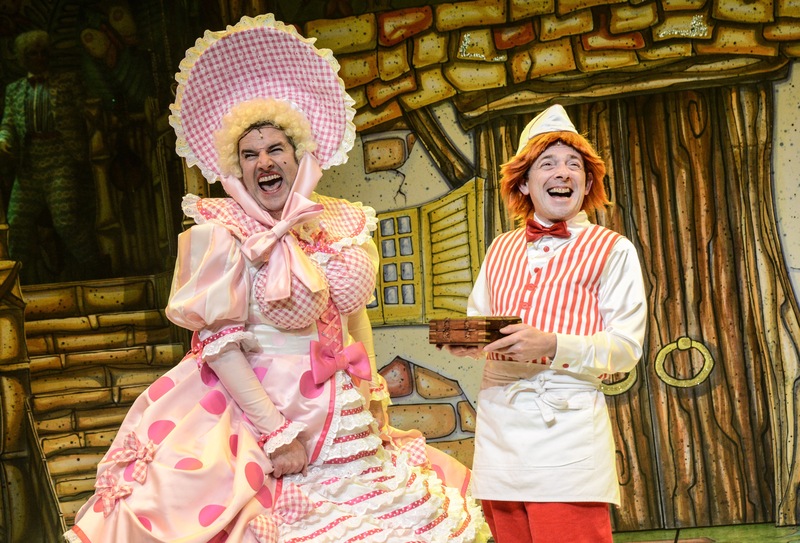 If ever there was a recipe for the perfect Christmas then a generous helping of panto-shaped fun should surely be at the heart of the ingredients. It’s fair to say that team We Are Chester love a bit of panto each Christmas and this year we are reviewing a fair few to give you some pointers if you are simply spoilt for choice. Our deputy editor Antonia Merola Jones has been to the Tip Top Productions panto, Aladdin and I decided to venture a bit further afield to the iconic Everyman theatre in the heart of Liverpool. I’ve been told that the Everyman’s traditional festive show is not to be missed. And I am not disappointed, from the moment I cast eyes on the glittery Christmas card-esque set, complete with a winter wonderland with icicles and penguins and the contrasting hot lands, festooned with palm trees. There’s a Chester link here, too, with Chester-based actor/musician/singers Francis Tucker and Lucy Thatcher in two of the lead roles in this fast-paced show. Lucy and Francis, who run the North West End Acting School in Chester, play the Snow Queen and the Dame, Beau Peep Po. And we must say that they both shine throughout – not easy amongst such a multi talented cast and amidst all of the panto glitter and glitz. Francis pulls a range of unforgettable comedy faces and excels at the slapstick and the double entendres, donning an astounding array of over the top costumes which are an absolute joy to behold. He’s also the king of the ad-lib, with superb comic timing. And Lucy Thatcher is a spellbindingly majestic snow queen, also known as Viletta, channelling her inner evil side as well as occasionally showing her softer side when she tries to attract the attention of the handsome Malakai (Jamie Noar). But Malakai is in love with our charming heroine Laputa (Nikita Johal). Lucy has an incredible voice, showing off her depth and range with a number of songs throughout the show. Oh, and she has also choreographed the show and plays a number of instruments. I’m shattered just typing this. Just in case you’re wondering, there’s just the right ratio of boos, hisses, sighs and obligatory shouts of “oh no it isn’t!” in this festive fiesta. And there are plenty of foot tapping and foot stomping songs to get even the most Scrooge-like of theatre goers up and out of their seats, dancing the night away. And, as is traditional in every good panto, the Dame picks out a volunteer for a bit of good old-fashioned fun. This time it is at the expense of Dave, or Dirty Dave, as he is christened by Beau Peep Po. Yes, there are jokes for the young ones along with plenty of chuckles aimed at the adults in the audience, and they lap it up, savouring every minute in this intimate theatre. The Everyman’s thrust stage coming out into the audience gives the action that bit more of an edge, with the sense that anything could happen and we’re all coming along for the ride. Mention must also be made of Beau Peep Po’s double act buddy Adam Keast, who plays the charmingly funny Toni Cornetto, with a fine line in Liverpudlian gelato, from Fazakerley apparently. Bravo to the cast for showing how adept they are at anything from flossing and singing to playing an array of musical instruments, overseen by the talented musical director Greg Last, with a stream of witty ad libs thrown in for good measure. Oh, and their wig game is strong. It’s hard to keep up with the various colours coming towards us atop the mega talented cast’s heads as they stroll or dance across the stage. All of the cast are superb in keeping up the pace and turning unexpected moments into part of the fun, just as if they had been scripted. How Nikita Johal resumes singing shortly after inhaling a snowflake we will never know! Lloyd Gorman is a captivating and rather loveable henchman to Viletta, known as Hench. He desperately tries to win Viletta’s cold heart. And Nicola Martinus-Smith enchants as the delightfully bouncy and glittery fairy Snowdrop, while Barbara Hockaday (Sensa/Speedwell/Babs the sheep/Santana and Whippet) shimmies across the stage in an array of fantastic outfits, ably demonstrating her versatility, which included belting out a number of songs. A huge well done to the cast and crew of this gloriously glittery and upbeat production. They are constantly poised to sing, crack a few jokes or interact with the packed auditorium, all keen to enjoy a fantastically festive and upbeat night out in the welcoming heart of Liverpool courtesy of the Everyman.